Texting While Crossing The Street Now Illegal In Honolulu : The Two-Way Laws that ban tapping on a phone while driving have become common, but in Hawaii, a new escalation targets pedestrians. Pedestrians walk past a "Look!" sign on the crosswalk at the intersection of 42nd Street and Second Avenue in New York. 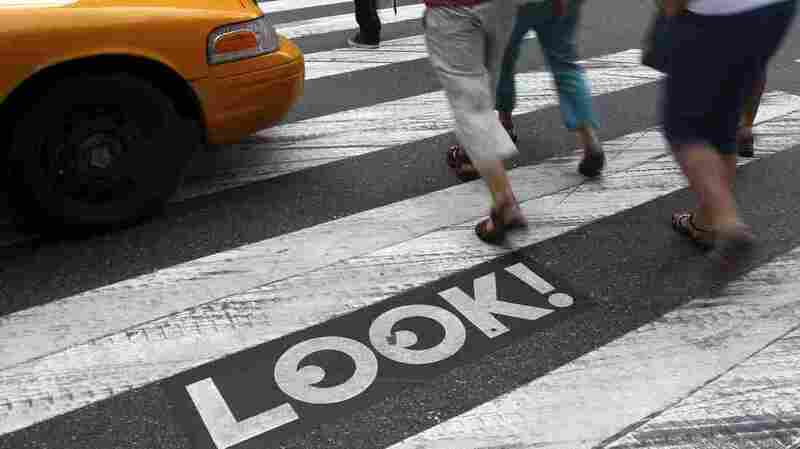 Cities all over the country are looking for ways to get pedestrians to pay more attention. Look both ways before you cross the street; and if you're in Honolulu, make sure to put away your phone, too. This week, the city became the first major U.S. city to pass legislation targeting texters and other "distracted walkers" as they step off the curb. Mayor Kirk Caldwell signed the bill, also known as the "Distracted Walking Law," on Thursday, after it was passed 7-2 earlier this month by the city council. "We hold the unfortunate distinction of being a major city with more pedestrians being hit in crosswalks, particularly our seniors, than almost any other city in the county," Caldwell said, according to Reuters. The Honolulu Police Department will begin enforcing the law on Oct. 25. Until then the department, which supports the law, will implement a three-month training and warning period, according to the Honolulu Star-Advertiser. After the law goes into effect, first-time violators will be fined $15-$35; second-time violators within the same year will be on the hook for $35-$75; and those who get ticketed a third time will be charged $75-$99. The law doesn't only target cellphone users; those using laptops, digital cameras or video games will also be expected not to look at them while crossing the street. Forty-seven states ban texting for drivers already, according to the Governors Highway Safety Association, and 15 states also ban phone calls with hand-held phones by motorists. Even though Honolulu is the first major city to outlaw texting-while-walking, Fort Lee, N.J., also banned the practice a few years ago. "Cellphones are not just pervading our roadways, but pervading our sidewalks too," Maureen Vogel, a spokeswoman for the nonprofit National Safety Council, told Reuters.